Excerpt: This afternoon, I want to focus on how we can gender female the maritime world of ships, waterfronts, and coastal communities– a world that scholars have largely populated with adult males– focusing on four questions. First of all, just saying, was there a female presence at sea? Two, what was the experience of women on shore, particularly in terms of maritime-oriented work? Three, what can a closer or prosopographical examination of one maritime community reveal about women’s status and family strategies? And last, how did the marine environment work through demographic processes to shape the role of women and household dynamics? 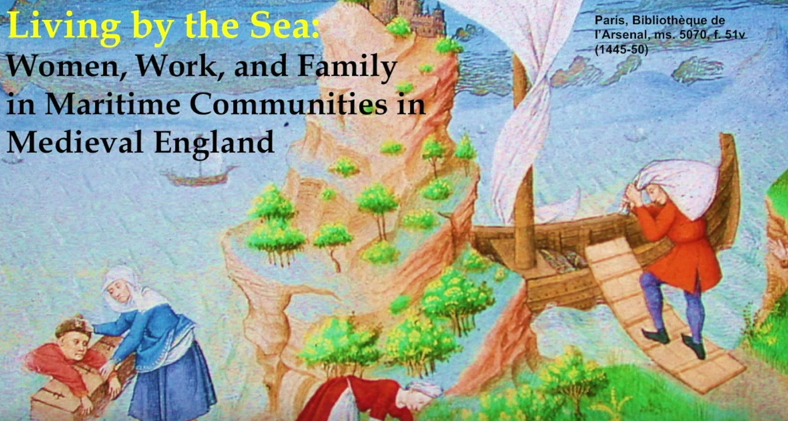 At Radcliffe, Maryanne Kowaleski is analyzing the types of work, economic strategies, languages, value systems, and family structures of those residing near the sea in medieval England. The project contributes to current debates about the relationship between humans and natural resources by emphasizing how ecology shaped human lives in the premodern period. Her study attributes a powerful role to marine ecosystems in promoting a distinctive subculture among the inhabitants of coastal villages, small port towns, and even quayside neighborhoods in larger seaports.